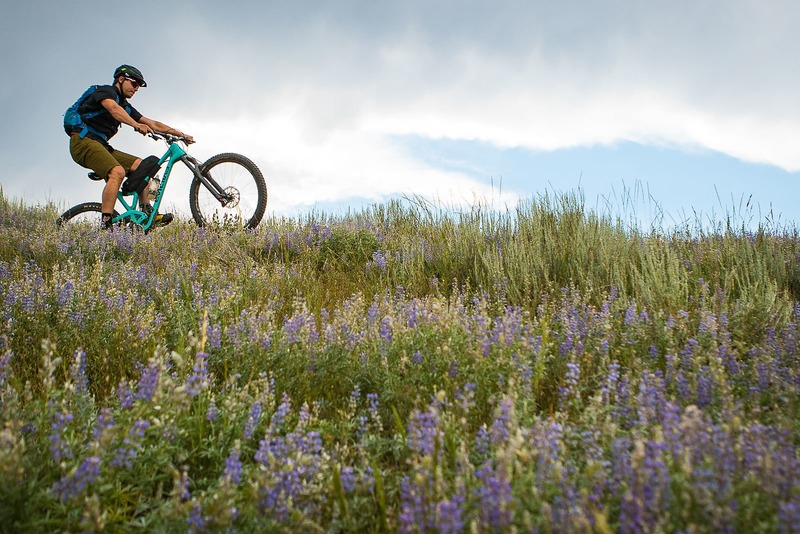 High alpine meadows and rocky ridge line descents—yes please. 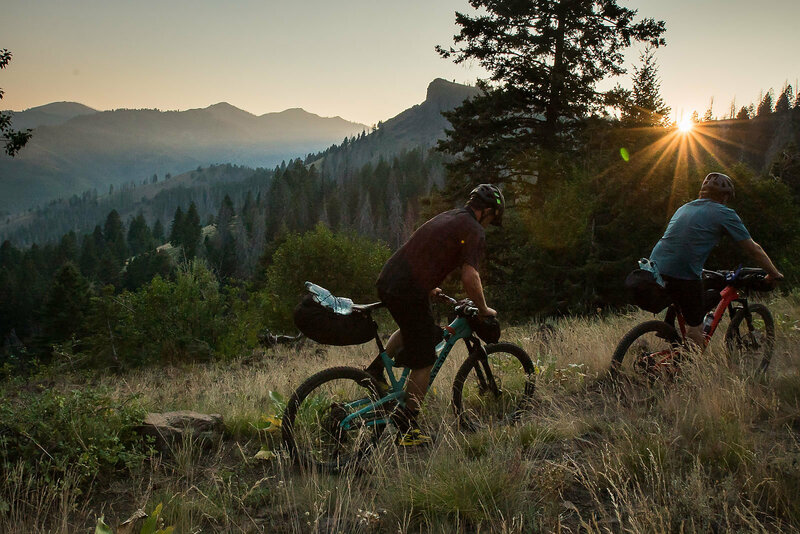 Steve Dempsey enjoys all the Sawtooth National Forest has to offer. 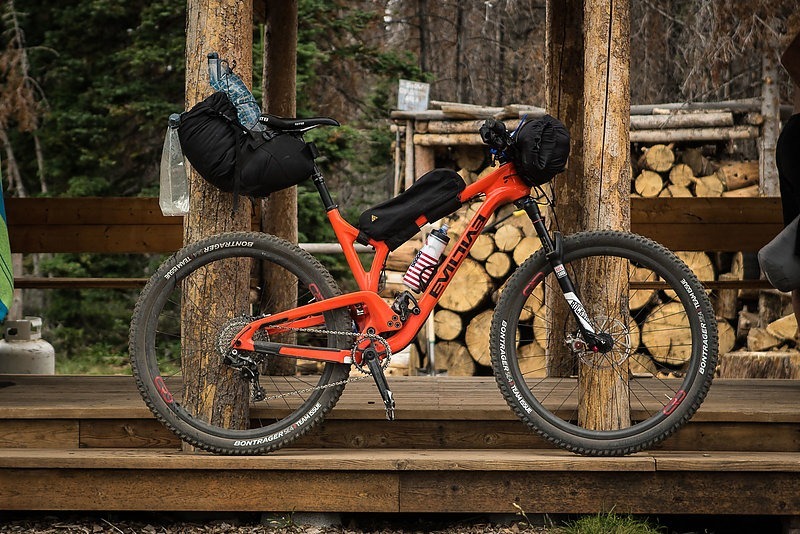 There are two ways to go about bike packing: the easy way, and the hard way. 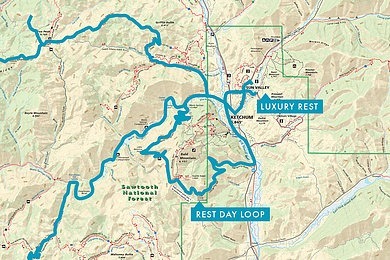 Some people opt for mellower routes, a majority of logging roads and relaxing days in the saddle. That, however, is not our style. Myself and longtime friend Brandon Watts wanted to ride a loop that would eliminate the use of cars and could access singletrack from the touchdown of a plane. We set out from Bellingham International Airport and flew into Hailey, Idaho’s Freidman Memorial Airport with our final destination as Galena Lodge, 35 miles away on highway 75. 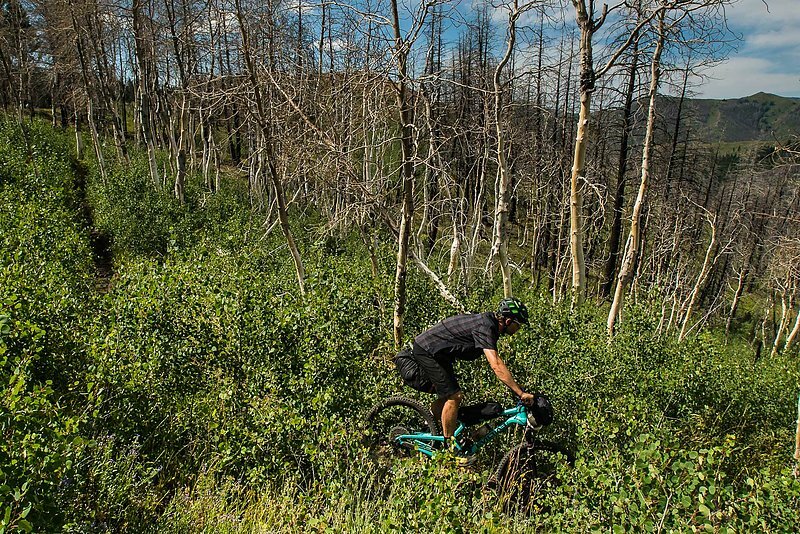 Our route needed to be as challenging as it would be spectacular, so we threw in a healthy dose of huge climbs and wildly fast singletrack descents. 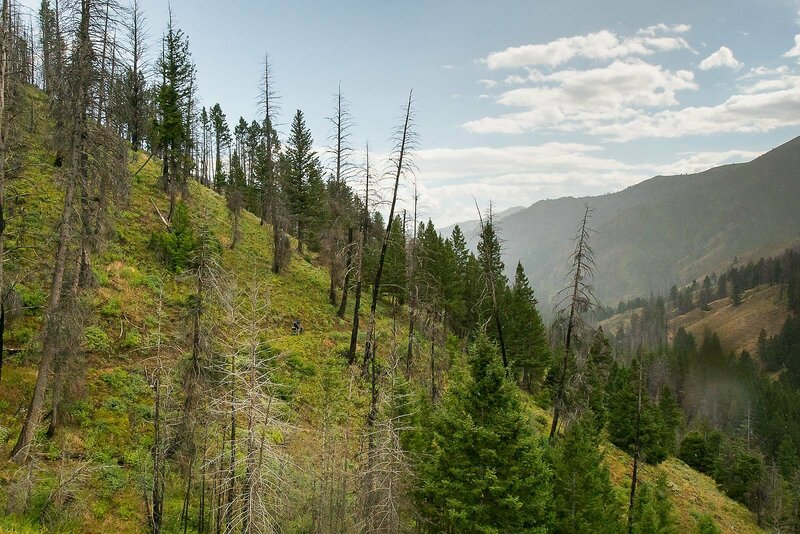 Linking together some of the area’s most iconic trails with as few logging roads possible, our route ended up being 113 miles with over 16,000 feet of climbing and nearly 14,000 feet of descent. Some of our local friends expressed doubt in the challenging selection of trails, but this only made us more ambitious. 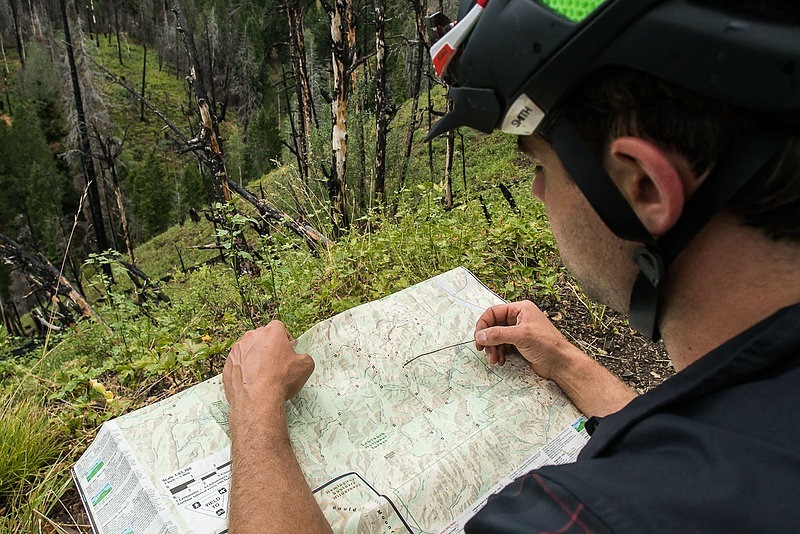 “It doesn’t look that far,” we justified, not privy to how fast the Idaho backcountry could consume us. Perhaps the one thing that helped most throughout the trip was the fact that we knew we were going about it the hard way. Although there were definitely some unforeseen obstacles (more on that later), we were fully prepared to chew down the the massive adventure we had bitten off. Pedaling straight from the airport means a few logging roads, but it's well worth it. The routine route check. It's important to check every once in a while, before you've gone too far. The miles of decent are hard earned, but totally worth it. 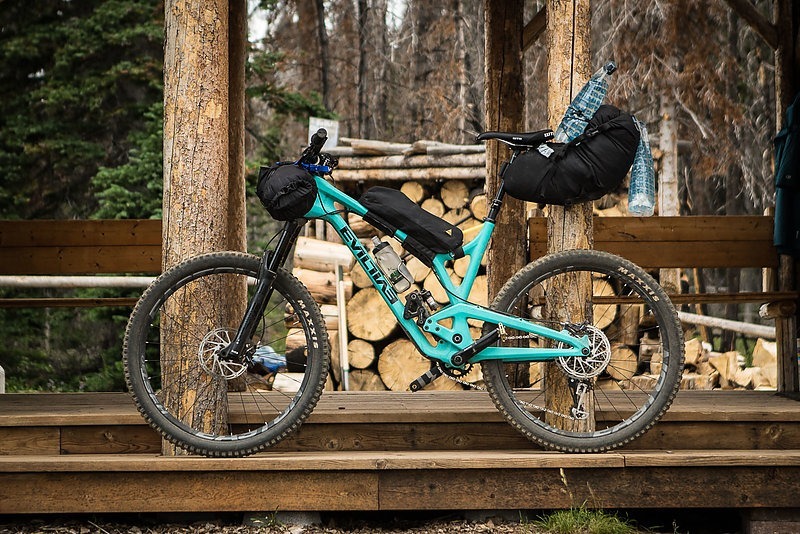 After flying into Hailey and piecing together our bikes at Sturtevants, we were immediately in search of food to fuel our expedition. You’ve got to feed the machine and eat as much as possible before heading into the backcountry. After a solid breakfast and a second cup of jet fuel-strong coffee at The Coffee House, we pedaled north on the Wood River Trail that follows along highway 75 to find Deer Creek Road. Blessed with supreme weather—cool temps with light rain—travel was quick, and spirits were high. Once the quality of the road conditions waned, our pace slowed and realization set in—this wasn’t going to be a cakewalk. Evidence of Idaho’s snowiest winter in 35 years was all around us in the form of huge washouts, displaced trees, river rock and debris. Our pedaling efforts increased significantly as we slowly whittled our way up toward our campsite off Mars Ridge. At washout number one, I decided to go with the pedal-fast-and-hope-you-make-it approach, despite Brandon’s skepticism. I made it through, but it was pretty loose and my feet were fully soaked. 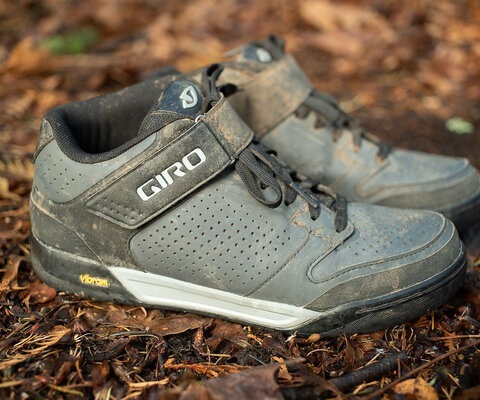 We took a more casual approach to the next dozen-plus creek crossings and washouts. 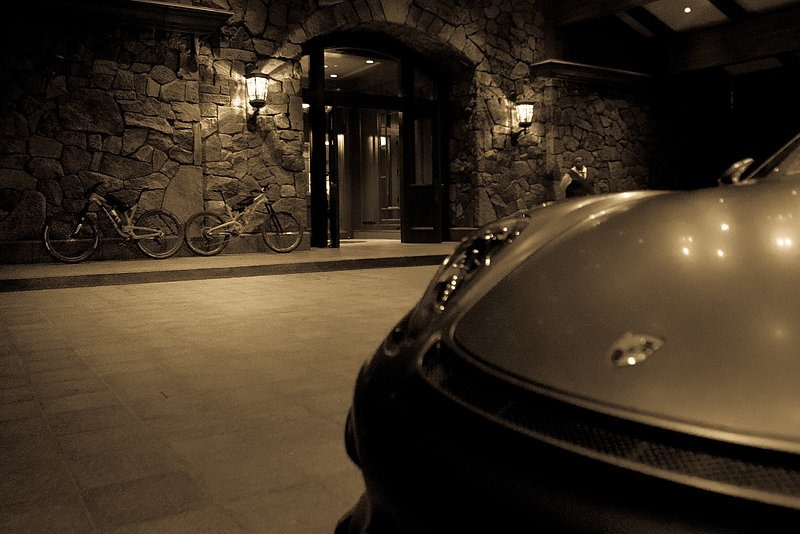 As we continued, roads became trails, opening the path to true adventure. This singletrack was incredible and pristine, but also a lot of work. We slowly worked our way up the mountain, finding many more creek crossings, keeping our shoes as full as our water bottles. The climb was arduous and we started to feel the elevation. We were just two sea level boys getting worked over by Mother Nature—a beautiful and brutal experience. Upon making our final turn onto Mars Ridge, we began to understand why this trail was named after a distant planet filled with red rocks and towering bluffs. 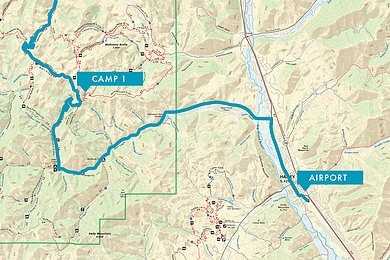 The trail was a ribbon of beauty that led us to a restful night and decadent dinner (by camp standards). At the end of the day, we knew we had underestimated the difficulty of the climbing in conjunction with the heavily loaded bikes, but were still just as excited. I wouldn’t have wanted to be anywhere else in the world. Somehow, there's always "one more ridge." 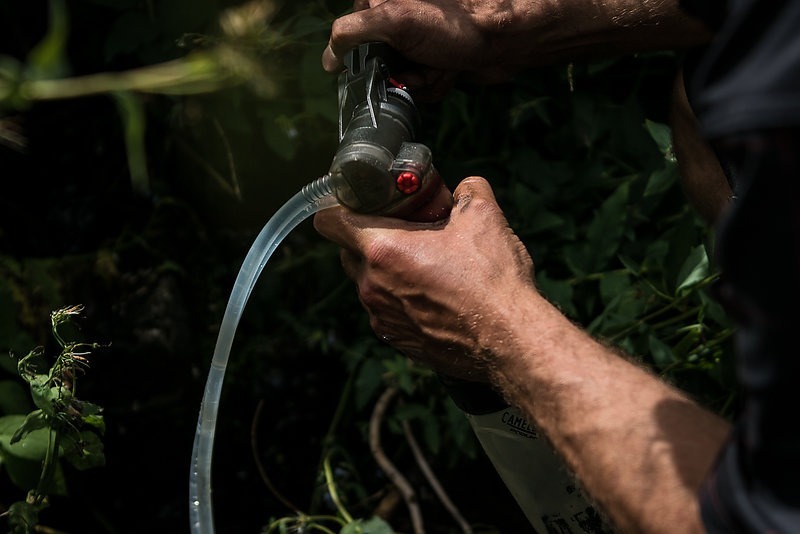 Knowing when and where your water sources are is crucial in the backcountry. 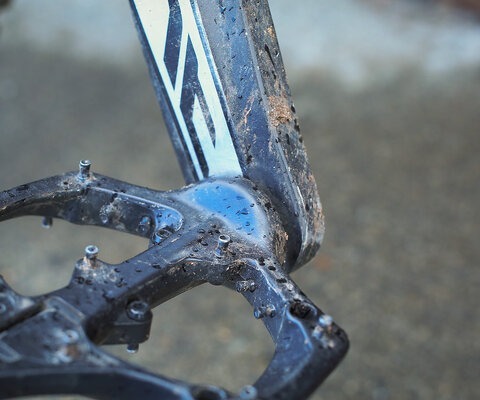 Weighed down, but fully hydrated—it's a scenario that has both advantages and disadvantages. Blurring through the burn. 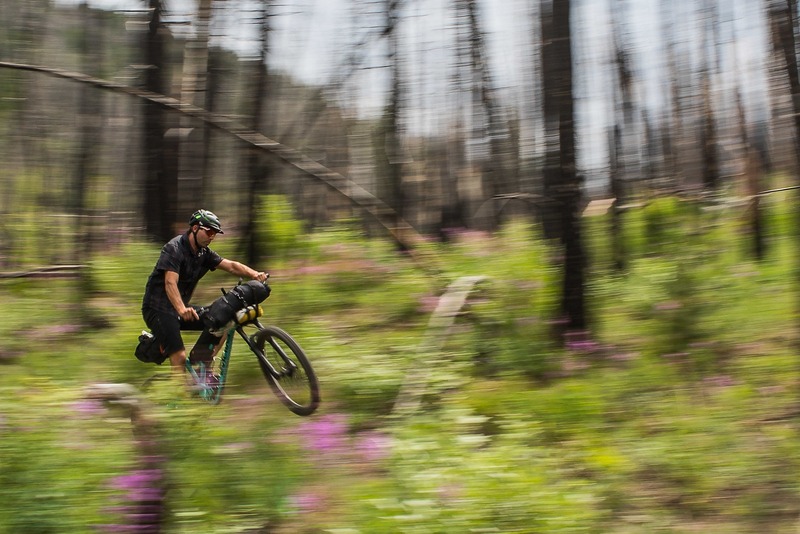 No one ever said bike packing can't involve high-speed manuals. We broke camp early to find our way off the ridge under beautiful blue skies. Our first mistake of the day came early on, as we used our remaining water to make coffee. Although delicious, the resounding thirst that followed was not. We each only had one full bottle of water—not ideal for a six-hour pedal in the sun. At least the trail was superb. With beautiful views, we found our eyes wandering from the trail to the scenery. The ridgeline was a series of broken granite rocks around a knife-thin trail. With loaded bikes we had to keep our skills on point and keep the rubber side down. We began the long decent to Warm Springs Road, really feeling our dehydration. Finally crossing a stream mid decent, four hours since we last had water, we drank until the belly could take no more. The woods were beaming with life; buzzing bees, hummingbirds with high-speed flybys, birds of prey, mule deer and grouse. A quick descent put us at the final stream crossing of the day. Ice-cold water had never felt so good and Frenchman’s Hot Springs lie less than a quarter mile down the road—a godsend after another long day. 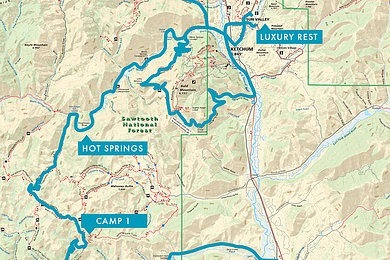 After a quality soak, it was a mellow (by the day’s standards) 10-mile pedal back into civilization. 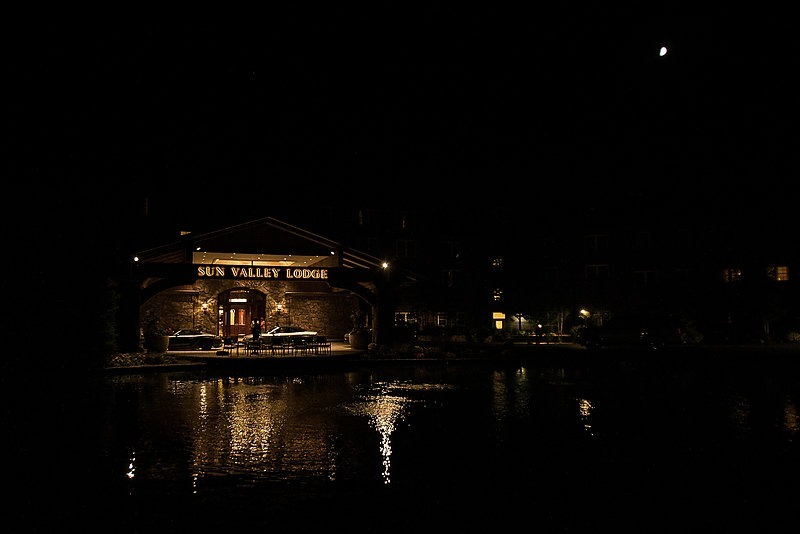 Fully hydrated and rejuvenated by the mineral hot springs, a hearty meal and a good night’s sleep at Sun Valley Lodge were the only things that could have made the day any better—and they did. 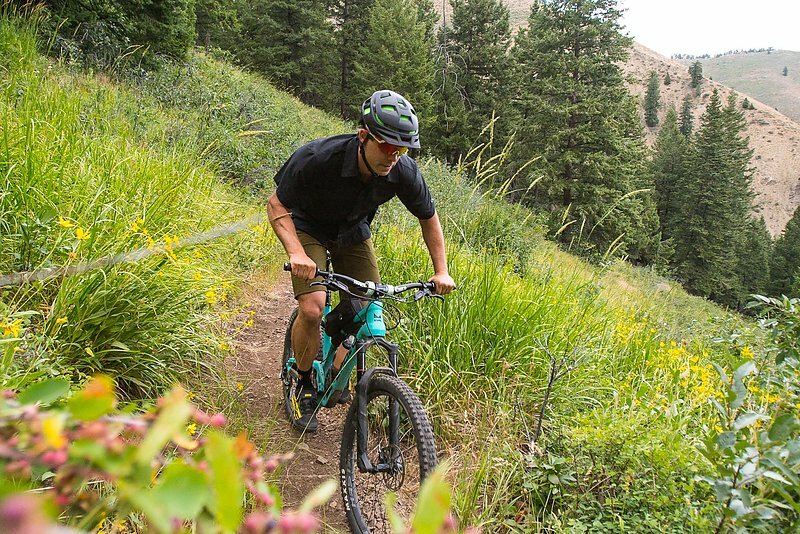 Steve Dempsey lets his excitement show as the the ridge line narrows into some fast and flowy singletrack. Until the speed factor gets slightly out of hand. 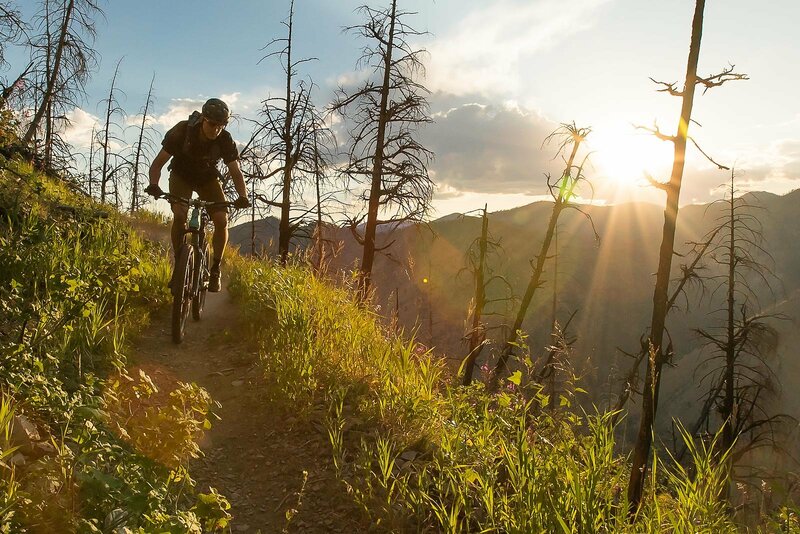 A golden hour descent back to town and a delicious meal. 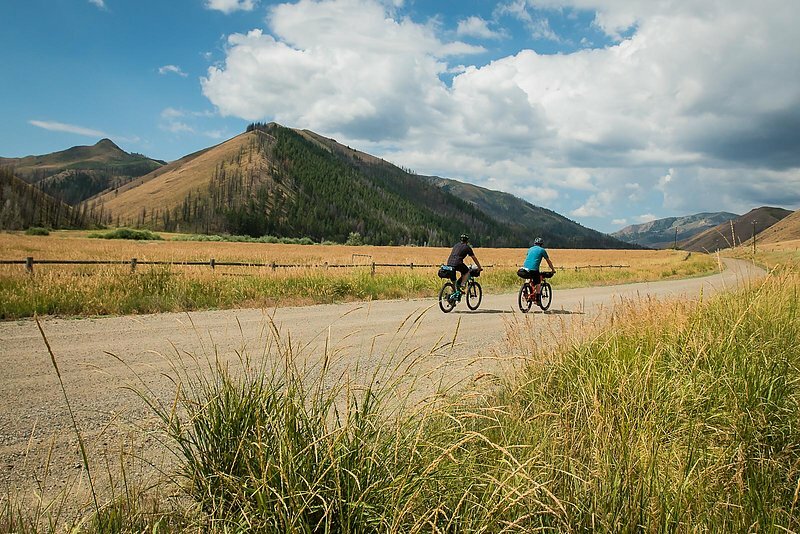 All the amenities of the Sun Valley Lodge are appreciated even more during a week long bike packing trip. Slightly out of place, but no one seemed to mind. We were looking forward to an awesome day exploring the unabated singletrack riding right from town. After a recharge for the mind and body thanks to a comfortable bed and delicious meal, we capitalized on the opportunity to loose some of our gear for a day of fast riding. What we originally estimated to be an easy “off day” turned out to be yet again another grinder. 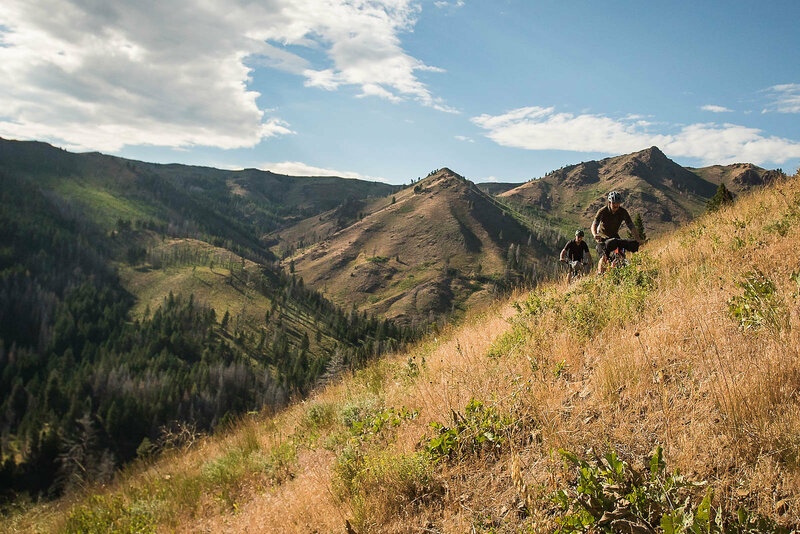 We figured without having the weight of our bikepacking bags, this ride would be a quick lap, starting and ending at the Sun Valley Lodge. “Just circumnavigating Sun Valley,” we told ourselves. In typical fashion, we were overly optimistic. The energy from the morning’s eggs benedict at Konditorei Restaurant faded quickly and we left the lodge with only a few cliff shots and mental perseverance to get us through the day. The whole scenario was very reminiscent of our formative years, pedaling through the Pisgah National Forrest, getting lost for hours on end with no food or water. Some people—like us—never learn. The climb up Cold Springs left us wondering if we were truly as ignorant as we thought, considering our lack of preparation, but as we dropped into Warm Springs, we couldn’t help but smile despite our zombie-like state. The trail was absolutely amazing, with corners that were loose and zesty. The spice got a little too hot and I found myself flying head-first off the trail at full speed. I got lucky with a minor slide and stopped short of some big timber. Luckily I had Brandon to come pull me out of the brush, as I could not have got out if I tried. The day’s lesson: don’t ride your bike at full speed while bonking. We got a late start to the pedal as a few technical difficulties set us back several hours. The jury is still out on if it was an organized team of professional hoodlums hell-bent on sabotage or a simple manufacturing error. Regardless, one of our brakes was puking DOT fluid like an 18-year-old who drank too much Old English malt liquor. It wasn’t until 5 p.m. that we took off, way too late to try to get all the way up to Osberg Ridge before dark, but that didn’t stop us. 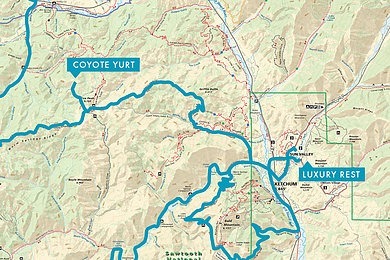 It was only four hours to the ridge and the Coyote Yurt on Fox Peak by our original calculations. However, this quickly turned out to be a four-hour push to the halfway point. We climbed along the creek side, meandering up the mountain, crossing back and forth over the rushing streams. With some solid local intel, we stopped at our last creek crossing and filtered water. Although the drink was always welcomed in our bellies, in our minds it was different. A minor feeling of dread would set in; so heavy, so far to climb, so much weight. After learning from our previous follies, we prepared for the worst and carried three extra bladders of water with us. The increased work of filtering and hauling paid off in full, for we set camp at 9:15 p.m. very tired, very hungry and very much short of the ridge we’d set out to conquer that morning. At least we were learning as we continued to make mistakes. 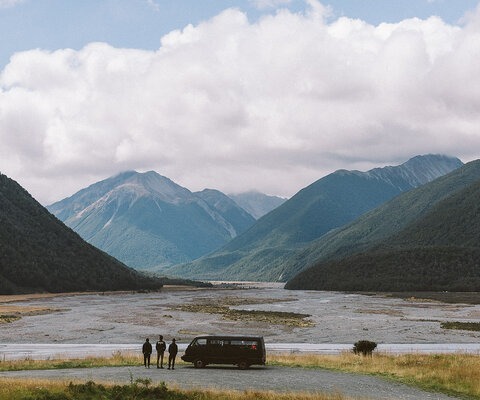 These wide open views and big mountains can be deceptive. What looks like it may be just around the corner may actually be two or three hours away. We enjoyed a world-class sunset from halfway up the ridge, the epic views of the Pioneer Mountain range slowly getting washed away by a layer of smoke working its way up the valley. A late start makes for all the more scenic pedaling. 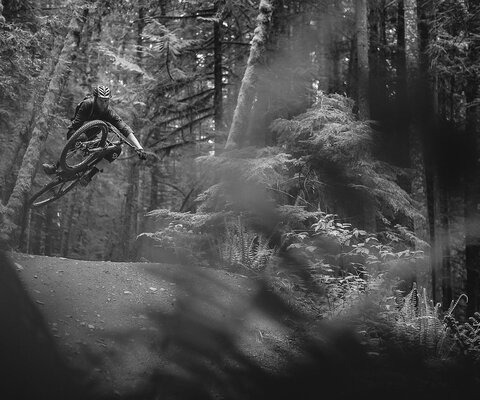 Once the sun is gone, temps drop and riding can get a little extra sketchy. A cold beer and a plate full of carne asada is both fuel and motivation. 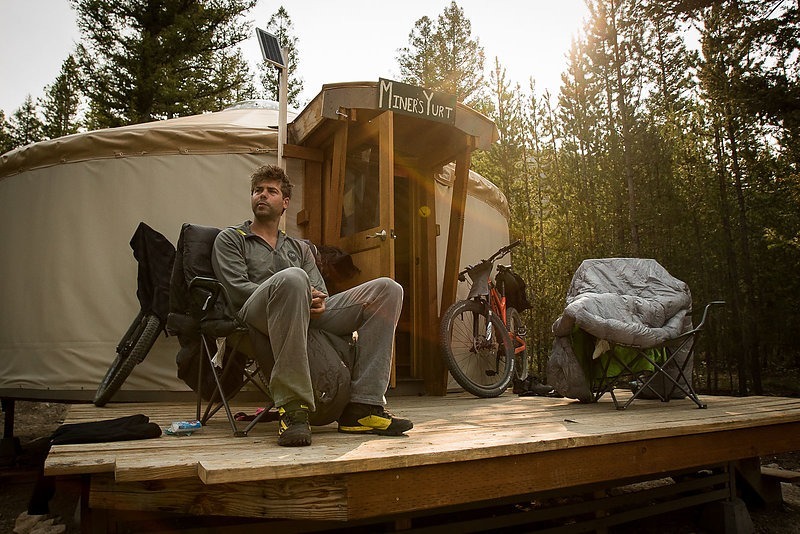 The Coyote Yurt provides amazing vistas and a relaxing scene. 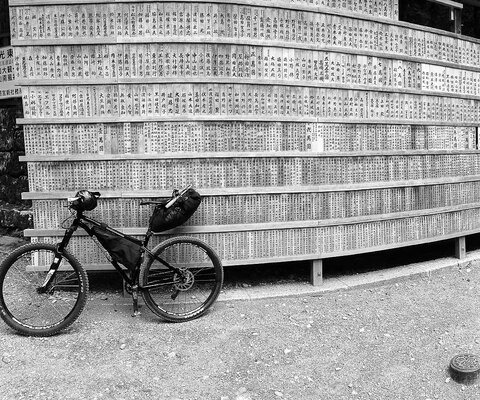 Evil's Following makes for a good bike packing machine. 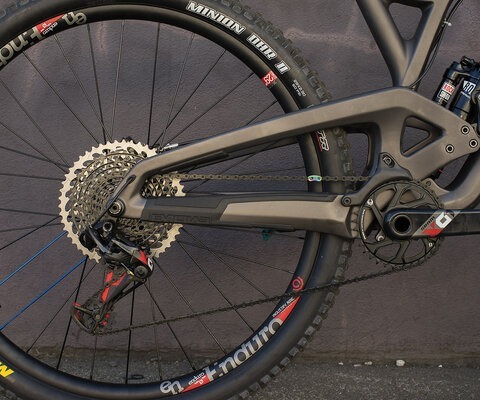 The Calling: Evil's short travel 27.5 bike that is happy to take on long distances and any type of terrain. After another great sleep in the MSR AC Bivy, it was time to continue the previous day’s mission. In an effort to conserve drinking water we skipped breakfast and lunch, counting on dried meats and nuts—some salty, real-deal beef jerky can do wonders for the soul. Some of last night’s smoke had pushed off and our lungs were thankful, as we could feel the previous evening’s climb in the eyes, nose and throat. With one 21 oz. bottle of water each, we nursed the water as slowly as possible realizing we were several ridges and six miles of climbing short of the yurt. We saw only two other people: a fellow rider and a runner with two friendly retrievers. The dogs lifted our spirits and kept our minds off the water dilemma we were in. The trail was absolutely beautiful single-track, ebbing and flowing to the contours of the majestic Sawtooth National Forest. 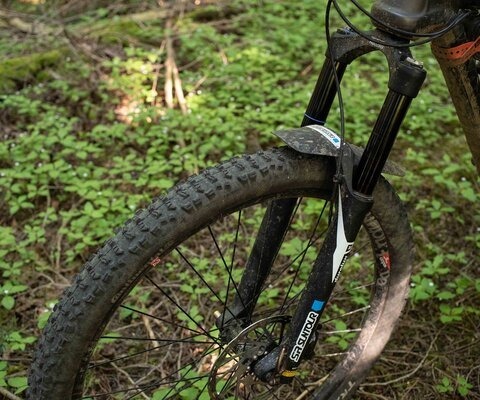 We let off the brakes and pumped through the flat sections with ease and started to close in the on that glorious natural spring that we had heard about and our destination of Coyote Yurt at the top of Fox peak. Each trail crossing got increasingly more exciting, knowing we were almost there. After a six-hour push on one water bottle, that mountain spring was the coldest, most refreshing water we had ever tasted. Time to eat, drink, and be merry. We waited for our friend Toby and his truck filled with food like a couple of dogs waiting for their owners to fill their food bowls. 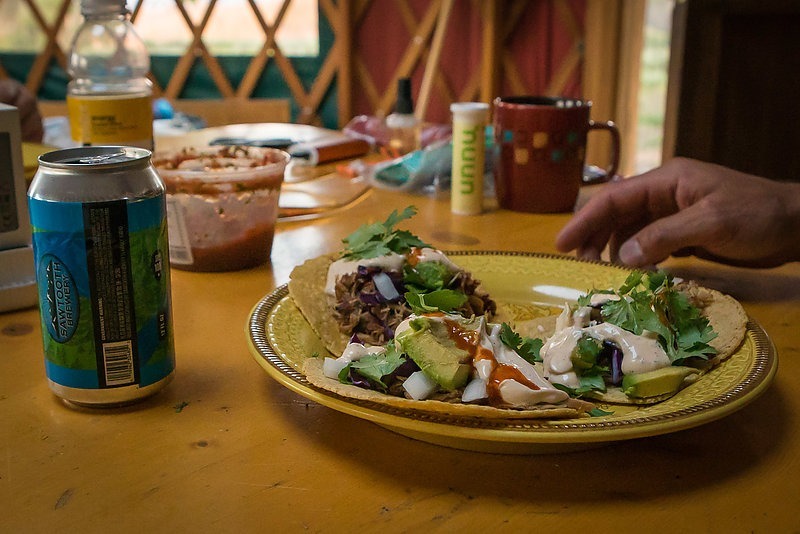 Thanks to Toby and the SV Trekking outfit running Coyote Yurt, we were gorging on carne asada and beer from Sawtooth Brewery, stretching, and prepping for the next day—31 miles to Galena Lodge, our biggest push yet. By day five, we were in better shape for our longest stretch of the trip. There was no water on the Osberg Ridge, so we made sure to hydrate the previous night and throughout the morning. In an effort to get the best morning light as well as take advantage of the cooler temps, we awoke early at 4:30 a.m. to make sure everything was in order. Toby was a huge help, waking early with us to prep a beautiful breakfast and send us out with a bagged lunch for our endeavor to come. On the bikes by 6:30 a.m., we were rolling strong. We had three bladders of water, a big sandwich compliments of Toby, snacks and a heady 32 oz. trail beer from Sawtooth Brewery for lunch. 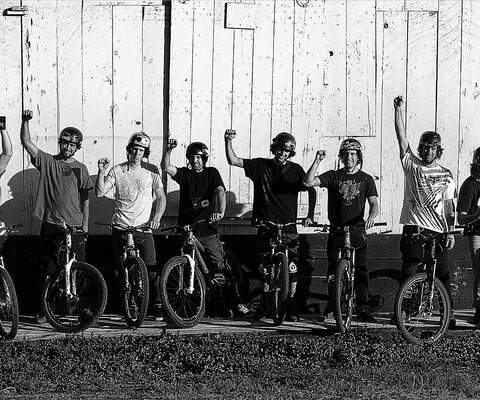 By far, the most dialed we had been yet. Upon reaching the top of Osberg Ridge, we were met with breathtaking views and an unreal spot to have lunch. 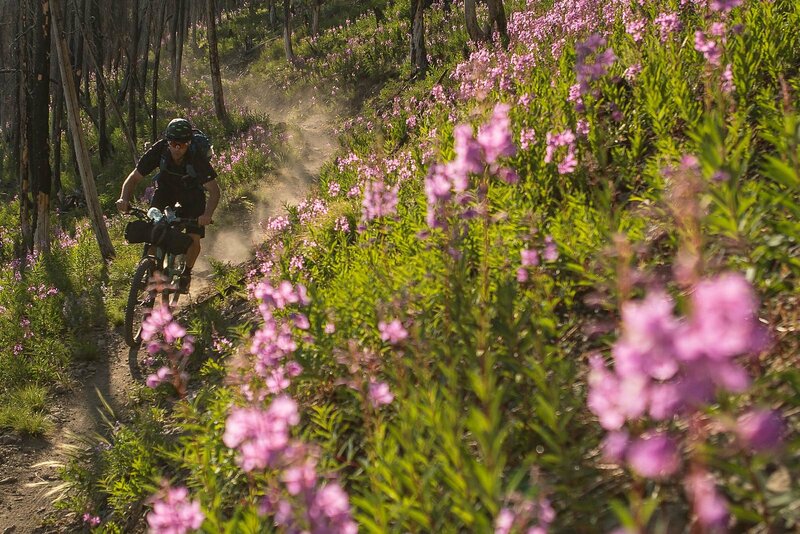 Descending from the summit, we cruised through burnt forests, lush mountain lupine and some of the most fun singletrack of the entire trip. From the ridgeline we dropped 3,382 feet to the valley below, hitting the Baker Creek Road that connected us to the Harriman trail leading us towards Galena Lodge. We still had 800 feet of climbing and over 10 miles to go before reaching our night’s destination at Galena’s Miner’s Yurt, but we were prepared. We pedaled on. Stopping at a creek to water up before the final service road, we found some reserved energy. Fully loaded with all our bottles full, we climbed up to our resting spot for the night. The final descent to Galena Lodge had mixed feelings: stoked to have finished the loop, but slightly bummed the trip was over. 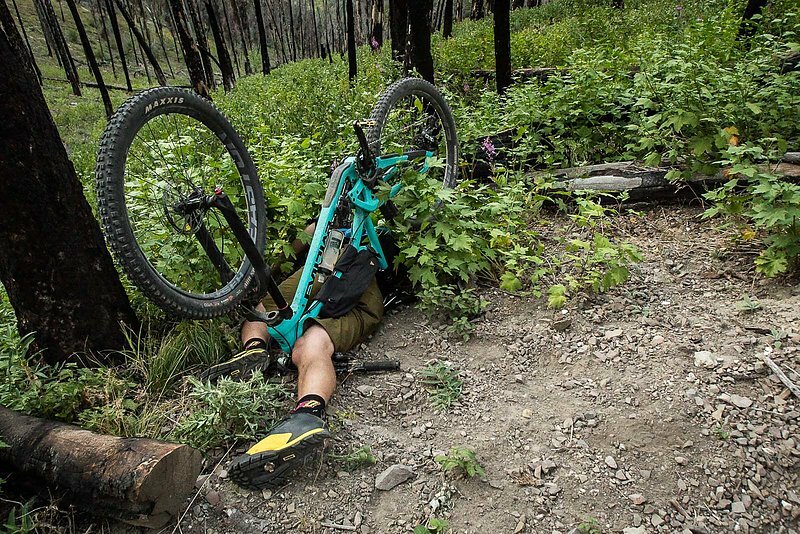 Steve Dempsey enjoys a relaxed morning before ripping singletrack to breakfast. Galena Lodge's world-famous Don Bar. 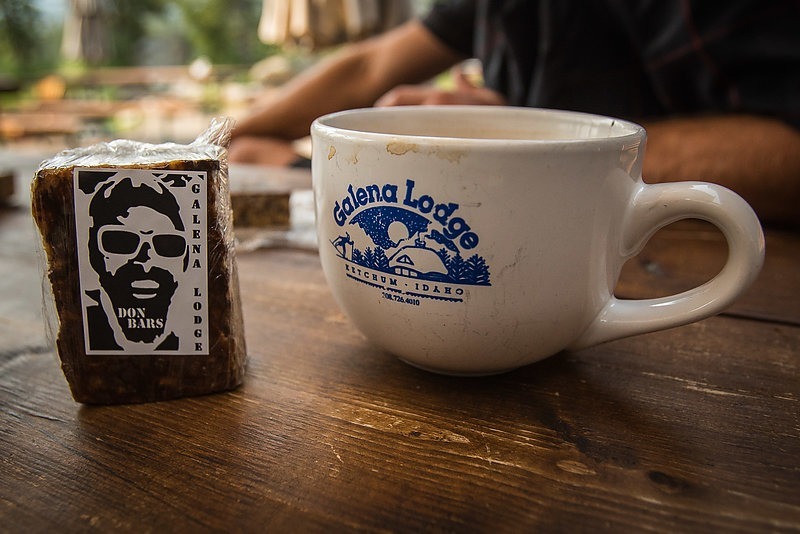 After a good night’s rest in the Miner’s Yurt, our hosts at Galena Lodge treated us to a wonderful meal of quality coffee, giant breakfast sandwiches and a well-earned bloody mary. Afterward, we sessioned some of the meandering trails around the lodge, delighted in the fact that we had no weight on our bikes and an endless supply of food and water. 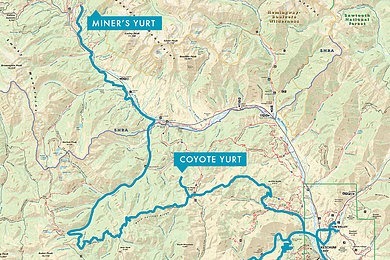 After several days in the backcountry, a few days of luxury at Sun Valley Resort, and the plush glamping style accommodations at Coyote and Miner’s Yurt, we were sad to be at the end of our adventure. We also happened to be quite exhausted, so we had our friends at Sturtevant’s pick us up in the famous Mountain Fairy Shuttle, dropping us back off at the Freidman Memorial Airport in Hailey. 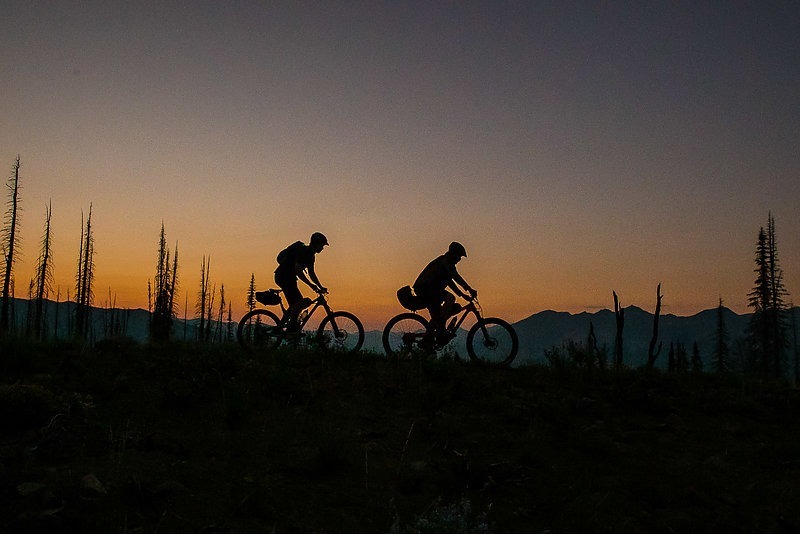 These epic days of singletrack and endless trail options were only made better by the community members that we met along the way, helping us navigate the ins and outs of trail conditions, ideal routes and the crucial spots to rehydrate. 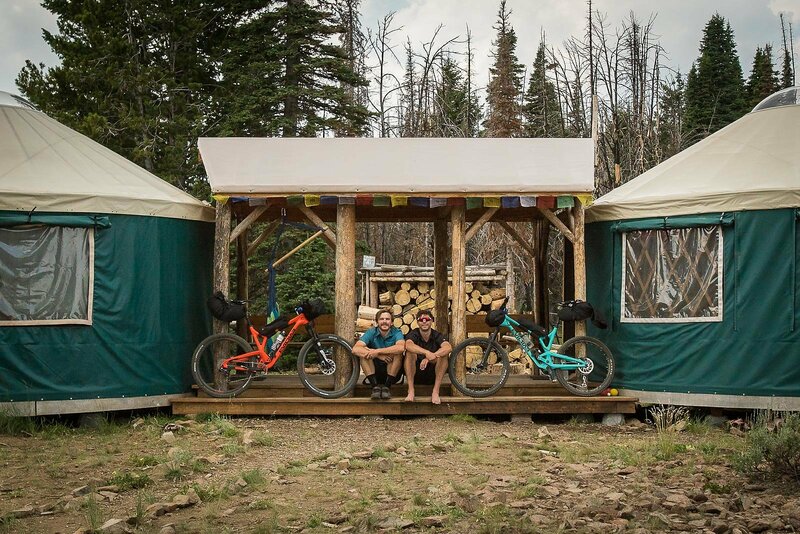 Anyone interested in planning a similar trip will undoubtedly be met by the same, open-minded folks that made this trip possible for two slightly delinquent riding buddies. We definitely had a few trying experiences throughout the week, some we learned valuable lessons from and others we didn’t. 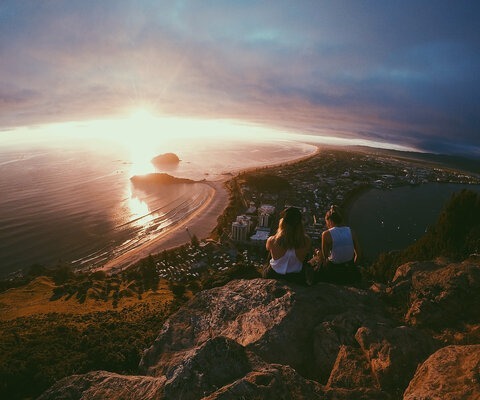 But it’s always slightly outside of the comfort zone that the true adventure happens, and that we got plenty of.